Improving the photoconversion efficiency of silicon solar cells is crucial to further the deployment of renewable electricity. Essential device properties such as lifetime, series resistance and optical properties must be improved simultaneously to reduce recombination, resistive and optical losses. Here, we use industrially compatible processes to fabricate large-area silicon solar cells combining interdigitated back contacts and an amorphous silicon/crystalline silicon heterojunction. The photoconversion efficiency is over 26% with a 180.4 cm2 designated area, which is an improvement of 2.7% relative to the previous record efficiency of 25.6%. The cell was analysed to characterize lifetime, quantum efficiency, and series resistance, which are essential elements for conversion efficiency. Finally, a loss analysis pinpoints a path to approach the theoretical conversion efficiency limit of Si solar cells, 29.1%. Battaglia, C., Cuevasb, A. & Wolf, S. D. High efficiency crystalline silicon solar cells: status and perspectives . Energy Environ. Sci. 9, 1552–1576 (2016). Green, M. A., Emery, K., Hishikawa, Y., Warta, W. & Dunlop, E. D. Solar cell efficiency tables (version 48) . Prog. Photovolt. Res. Appl. 24, 905–913 (2016). Taguchi, M. et al. HIT cells: high efficiency crystalline Si cells with novel structure . Prog. Photovolt. 8, 492–502 (2000). Lammert, M. D. & Schwartz, R. J. The interdigitated back contact solar cell: a silicon solar cell for use inconcentrated sunlight . IEEE Trans. Electron Devices 24, 337–341 (1977). Swanson, R. M. et al. Point-contact silicon solar cells . IEEE Trans. Electron Devices 31, 661–664 (2005). Masuko, K. et al. Achievement of more than 25% conversion efficiency with crystalline silicon heterojunction solar cell . IEEE J. Photovolt. 4, 1433–1435 (2014). Smith, D. D. et al. Silicon solar cells with total area efficiency above 25%. In 2016 IEEE 43rd Photovoltaic Spec. Conf. 3351–3355 (IEEE, 2016). Adachi, D., Hernandez, J. L. & Yamamoto, K. Impact of carrier recombination on fill factor for large area heterojunction crystalline Si solar cell with 25.1% efficiency . Appl. Phys. Lett. 107, 233506 (2015). Green, M. A., Emery, K., Hishikawa, Y., Warta, D. & Dunlop, E. D. Solar cell efficiency tables (version 39) . Prog. Photovolt. Res. Appl. 20, 12–20 (2012). Kerr, M. J., Cuevas, A. & Campbel, P. Limiting efficiency of crystalline silicon solar cells due to Coulomb-enhanced Auger recombination . Prog. Photovolt. Res. Appl. 11, 97–104 (2003). Richter, A., Hermle, M. & Glunz, S. W. Reassessment of the limiting efficiency for crystalline silicon solar cells . IEEE J. Photovolt. 3, 1184–1191 (2013). Taguchi, M. et al. 24.7% record efficiency HIT solar cell on thin silicon wafer . IEEE J. Photovolt. 4, 96–99 (2014). Hernandez, J. L. et al. High efficiency silver-free heterojunction silicon solar cell . Jpn. J. Appl. Phys. 51, 10NB04 (2012). Hernandez, J. L. High efficiency copper electroplated heterojunction solar cells. In Proc. 27th EUPVSEC 655–656 (WIP, 2012). Hernandez, J. L. et al. High efficiency copper electroplated heterojunction solar cells and modules—The path towards 25% cell efficiency. In Proc. 28th EUPVSEC 741–743 (WIP, 2014). Wolf, S. D., Descoeudres, A., Holman, Z. C. & Ballif, C. High efficiency silicon heterojunction solar cells: a review . Green 2, 7–24 (2012). Franklin, E. et al. Design, fabrication and characterisation of a 24.4% efficient interdigitated back contact solar cell . Prog. Photovolt. Res. Appl. 24, 411–427 (2014). Dingemans, G. & Kessels, W. M. M. Status and prospects of Al2O3-based surface passivation schemes for silicon solar cells . J. Vac. Sci. Technol. A 30, 040802 (2012). Green, M. A. The Passivated Emitter and Rear Cell (PERC): from conception to mass production . Sol. Energy Mater. Sol. Cells 143, 190 (2015). Green, M. A. 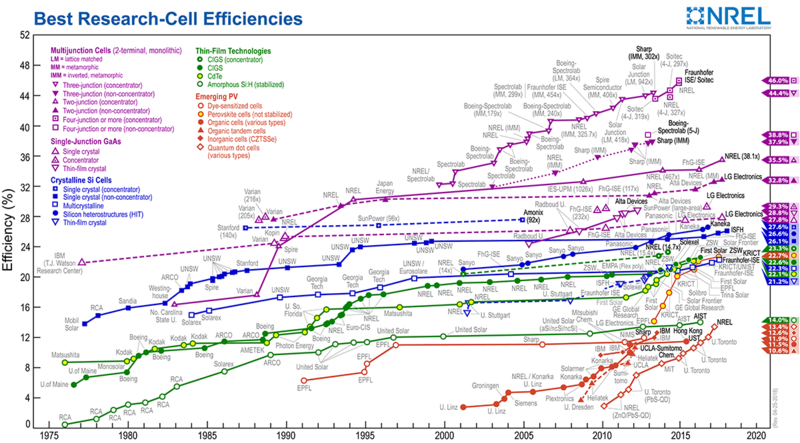 The path to 25% silicon solar cell efficiency: history of silicon cell evolution . Prog. Photovolt. Res. Appl. 17, 183–189 (2009). Zhang, S. et al. 335 watt world record p-type mono-crystalline module with 20.6% efficient PERC solar cells . IEEE J. Photovolt. 6, 145–152 (2016). Harrisona, S. et al. Back contact heterojunction solar cells patterned by laser ablation . Energy Procedia 92, 730–737 (2016). Desrues, T., De Vecchi, S., D’Alonzo, G., Muñoz, D. & Ribeyron, P.-J. Influence of the emitter coverage on interdigitated back contact (IBC) silicon hetero-junction (SHJ) solar cells. In Proc. 40th IEEE Photovoltaic Spec. Conf. 857–886 (IEEE, 2014). Lee, S. Y. et al. Analysis of a-Si:H/TCO contact resistance for the Si heterojunction back-contact solar cell . Sol. Energy Mater. Sol. Cells 120, 412–416 (2014). Tomasi, A. et al. Backcontacted silicon heterojunction solar cells with efficiency > 21% . IEEE J. Photovolt. 4, 1046–1054 (2014). Mingirulli, N. et al. Efficient interdigitated back-contacted silicon heterojunction solar cells . Phys. Status Solidi 5, 159–161 (2011). Nakamura, J. et al. Development of heterojunction back contact Si solar cells . IEEE J. Photovolt. 4, 1491–1495 (2014). Salomon, B. P. et al. Back-contacted silicon heterojunction solar cells: optical-loss analysis and mitigation . IEEE J. Photovolt. 5, 1293–1303 (2015). Aberle, A. G. Surface passivation of crystalline silicon solar cells: a review . Prog. Photovolt. 8, 473–487 (2000). Wang, E. Y., Yu, F. T. S., Sims, V. L., Brandhorst, E. W. & Broder, J. D. Optimum design of anti-reflection coating for silicon solar cells. In 10th IEEE Photovoltaic Spec. Conf. 168–171 (IEEE, 1973). Fields, J. D. et al. The formation mechanism for printed silver-contacts for silicon solar cells . Nat. Commun. 7, 11143 (2016). Zhang, X., Wan, Y., Bullock, J., Allen, T. & Cuevas, A. Low resistance Ohmic contact to p-type crystalline silicon via nitrogen-doped copper oxide films . Appl. Phys. Lett. 109, 052102 (2016). Frühaufa, F., Sayadb, Y. & Breitensteina, O. Description of the local series resistance of real solar cells by separate horizontal and vertical components . Sol. Energy Mater. Sol. Cells 154, 23–34 (2016). Sinton, R. A. & Cuevas, A. A quasi-steady-state open-circuit voltage method for solar cell characterization. In 16th Eur. Photovoltaic Solar Energy Conf. 1152–1155 (WIP-Renewable Energies, 2000). Richter, A., Glunz, S. W., Werner, F., Schmidt, J. & Cuevas, A. Improved quantitative description of Auger recombination in crystalline silicon . Phys. Rev. B 86, 165202 (2012). Cuevas, A. & Macdonald, D. Measuring and interpreting the lifetime of silicon wafers . Sol. Energy 76, 255–262 (2004). Glunz, S. W., Nekarda, J., Mackel, H. & Cuevas, A. Analyzing back contacts of silicon solar cells by Suns-Voc-measurements at high illumination densities. In 22nd Eur. Photovoltaic Solar Energy Conf. 849–853 (WIP-Renewable Energies, 2007). Chavali, R. V. K. et al. A generalized theory explains the anomalous Suns–Voc response of Si heterojunction solar cells . IEEE J. Photovolt. 7, 169–176 (2016). Swanson, A. Approaching the 29% limit efficiency of silicon solar cells. In Proc. 31th PVSC, Colorado Springs 889–895 (Drupal, 2005). This work was supported in part by the New Energy and Industrial Technology Development Organization (NEDO) under the Ministry of Economy, Trade and Industry of Japan. K.Yoshikawa designed the experiments and analysed the data. D.A. and K.Yamamoto supervised the study. K.Yoshikawa., H.K., W.Y., T.I., K.K., K.N., T.U. and M.K. contributed to development of the HJ-IBC cell, optimization of optical properties, passivation quality and resistivity. K.Yoshikawa, D.A. and K.Yamamoto wrote the manuscript. All authors discussed the results and commented on the manuscript. The authors are employees of Kaneka Corporation.